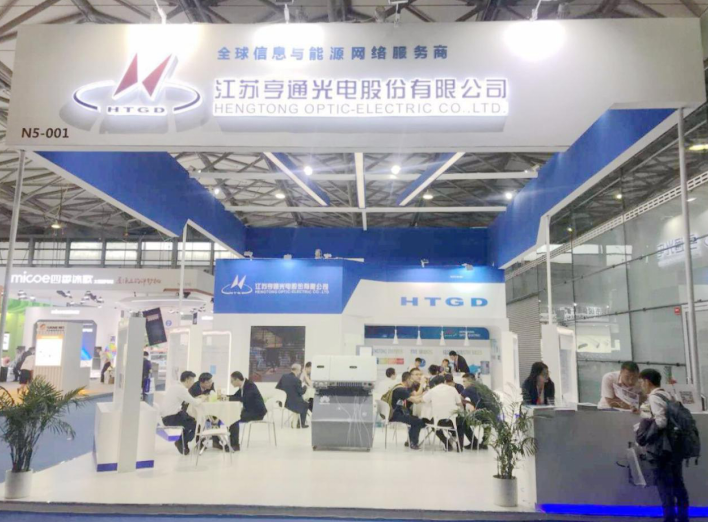 On May 28-30, as a full-value chain integrated service provider in the information and energy transmission industry, Hengtong made a shining appearance in the 12th International Solar Photovoltaic and Intelligent Energy Exhibition ("SNEC") in Shanghai New International Expo Center, with products and solutions concerning clean energy package project. Led by Asia Photovoltaic Industry Association, China Renewable Energy Society, Renewable Energy Professional Committee of China Recycling Economy Association, Shanghai New Energy Industry Association, etc., SNEC was jointly hosted by 19 international institutions and organizations including American Solar Industry Association. This SNEC exhibition, with a total area of more than 200,000 square meters, brought together 1800 well-known photovoltaic industry related enterprises around the world. It showcased many new technologies and new products that combine photovoltaic with energy Internet of things, AI, big data and so on. At the exhibition, Hengtong mainly demonstrated the solutions and comprehensive strength in the field of clean energy package project, and put forward such superior products as photovoltaic cable, photovoltaic welding tape, photovoltaic engineering design, operation and maintenance service and so on, as well as package solutions in other areas of energy industry, receiving strong attention from industry partners and customers at home and abroad and attracting endless on-site visitors and information exchange. Thanks to Hengtong’s "product + engineering" dual-wheel driven development model, deep cultivation of clean energy industry, professional engineering design and consulting team, strong financial strength as well as the accumulation of global leading technologies and qualifications in fields of communications, electricity and oceans, the company has undertaken more than 30 clean energy industry package projects at home and abroad, making significant contributions to environmental protection and energy structure upgrading. More importantly, Shandong Dongyingxi and "Complementation of Fishing and Light" photovoltaic power generation project, with a total investment of 120 million US dollars, was awarded as the benchmark project of Dongying city's urban transformation and economic structure adjustment. In the future, from the global perspective, Hengtong will actively promote the development of clean energy, and strive to create a leading full-value chain integrated service provider in information and energy transmission industry, in order to provide global customers with package project services and life-cycle management projects including feasibility research, investment and financing scheme planning, survey and design, project construction, operation, and maintenance, building clean energy era.